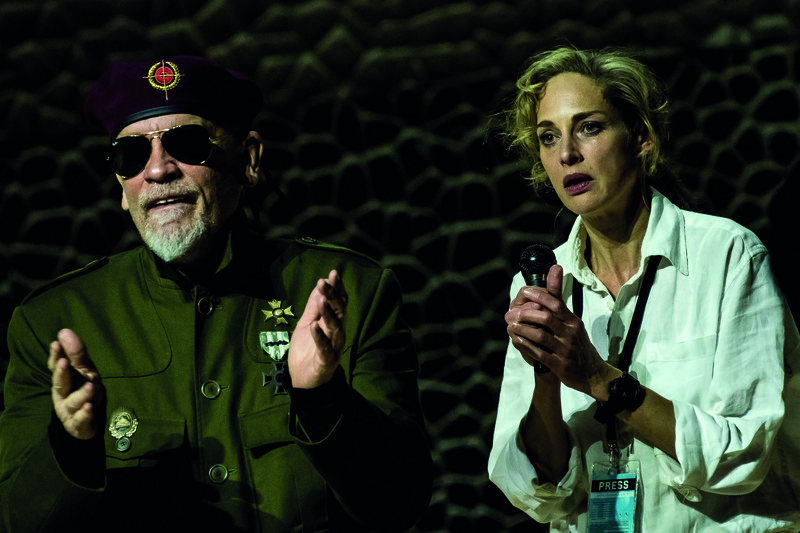 Hollywood star John Malkovich takes to the stage in just two venues on the UK dates of this international tour and Birmingham Symphony Hall played host to the first. In Just Call Me God: A Dictator's Final Speech Malkovich plays Satur Diman Cha, the leader of Circassia, who, as enemy forces close in, is hiding out in the underground theatre of his vast palace in the last moments of his power. When a group of soldiers and the press discover the room, the dictator has his final curtain call. Killing most of the group, he keeps two alive – a journalist to record his final speech and an organist to ensure musical accompaniment. Malkovich is a consummate performer who quickly has not just these two under his spell but the entire audience mesmerised. Here is a man so full of self-importance that he will take to the podium to deliver polemic even when he knows his hours are numbered. Satur Diman Cha is a totally unlikeable character without a redeeming quality. He is foul-mouthed, sexually aggressive, violent, egocentric and cruel – and yet we still watch him and hang on his every word. From the moment he first shuffles in, dressed as a cleaning lady, to his dying breath, he controls the drama and the space. Sophie von Kessel is the television journalist forced at gunpoint to record Diman Cha's final messages. An ambitious woman who has dreamed of gaining an interview with the dictator, even now, when she fears for her life, she still sees the value of the scoop. The production is the third collaboration between Malkovich, Michael Sturminger as writer and director and Martin Haselböck as musical director and organist. This is a return to Symphony Hall for the group who brought the portrait of a serial killer The Infernal Comedy to the venue in 2012. The trio may be attracted by the macabre but they are also keen to look below the surface and make us question our assumptions. Diman Cha may be a horrible character but he does speak plenty of truths, making us think about power and control, story-telling and myth-making, and fear and suspicion. The action is filmed and projected onto two screens throughout so the audience is often watching the story replay in triplicate and the production makes good use of the venue, making Symphony Hall itself part of the story. The hall's mighty organ is also used well with Haselböck playing a range of music by Wagner and Bach as well as his own compositions. At 90 minutes without an interval, Just Call Me God is concentrated and intense. There is humour, albeit of a black kind, but the overall sense is of disquiet not least because we know that so much of what is being described has already been played out by different, real life, dictators the world over. Just Call Me God is performed at Union Chapel in London on March 23-25 se store.unionchapel.org.uk/ for more information.